Gaining abdominal weight isn't difficult but does require planning beyond eating cookies and avoiding the gym. Genetic makeup, lifestyle and body type determine where your body allocates excess fat. Although your entire body must gain weight to expand your belly size, certain strategies can enhance weight storage specifically in your midsection. Calorie sources and lifestyle can both expedite abdominal fat storage. Intentionally gaining weight in your midsection is risky but if you're determined to add to your belly pouch, understanding the causes and factors associated with weight gain will help maximize your belly size. Eat more high-fat calories than you use. An excess of calories from any source increases fat stores, but according to the National Institutes of Health, heavily processed foods high in fat, sugar and sodium increase weight most rapidly. Examples of good belly-expanding foods include processed high-fat lunch meat such as bologna or pepperoni, cake, fruit bread, full-fat cuts of meat, and cream-based sauces or dressings such as ranch or sour cream. Remaining sedentary enables your body to store excess fat and calories. Drink more alcohol. A 2005 study published in the International Journal of Obesity disproved the myth that only beer leads to a "beer belly." Researchers at the University College Medical School of London found that individuals who drank 21 or more units of alcohol per week had an increased waist circumference regardless of whether the alcohol was beer, wine, spirits or cocktails. 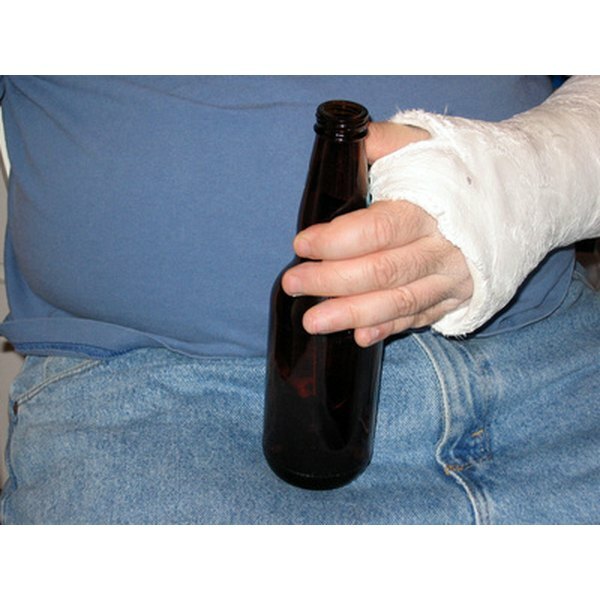 Although all subjects gained abdominal weight, those who drank three or more beers a day showed especially significant increases in waist circumference. Sleep less. A 2010 Dutch study found that the number of hours children slept was inversely related to their body mass index. A previous study conducted in Japan at the Niigata University School of Medicine in 1996 found that Japanese shift workers had a higher waist circumference than their day-working colleagues, despite similar diet and exercise regimens. Inadequate sleep strains your body and increases production of cortisol, a stress-related hormone that also regulates fat digestion. Excess cortisol in your body encourages weight gain. Limit your stomach size. According to the National Institute of Diabetes and Digestive and Kidney Diseases, having a waist circumference larger than 35 inches for a woman or 40 inches for a man significantly increases your risk of obesity-related health complications.